It belongs to the duty of weather reporters in Japan to announce forecasts on the autumn color of leaves just in the same way as on the cherry blossom front. Recently they repeatedly underline that the autumn color of leaves is especially fine this year thanks to the extremely hot summer and the sudden cooling down at the end of October. 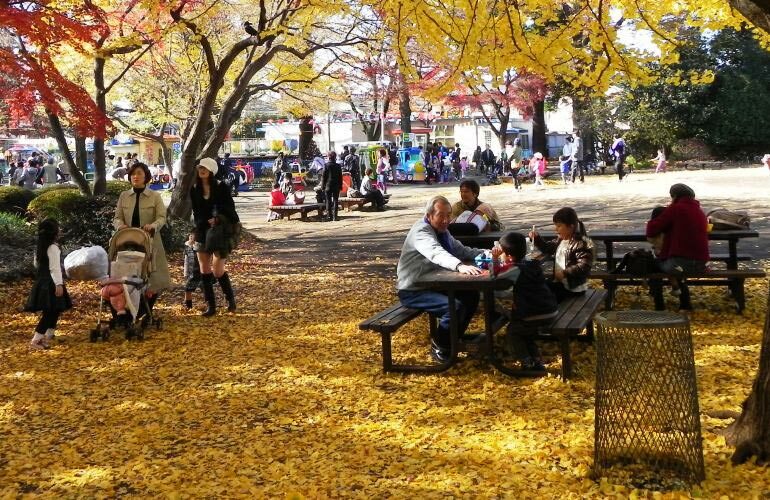 The good weather and the expectation for viewing beautiful autumn leaves increased the number of visitors in the Inokashira Park on the last weekend. The Inokashira Park is a popular destination for cherry blossom viewing. However, autumn leaves enchant people as well. The Inokashira Park opened in 1917 as the first public park of Tokyo in its suburbs. The center of the Inokashira Park is its spring. The spring water creates a pond and flows into Kanda-gawa. Kanda-gawa, strengthened with a few other tributes including Zenpukuji-gawa, served since the 17th century as the first water system of Edo. Of course the people in the Edo period were not the first who used the clear spring water in Inokashira. 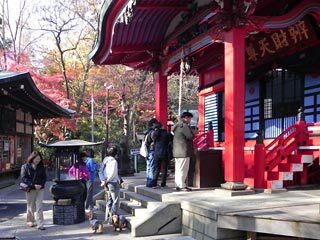 Inokashira Benzaiten, a small temple dedicated to Benzaiten, goddess for water and music, was probably established in the 10th century. There are also several dozens of remains of Neolithic houses and even some relics from the Paleolithic period in this area. This means that this area had traditionally favorable conditions as habitat. 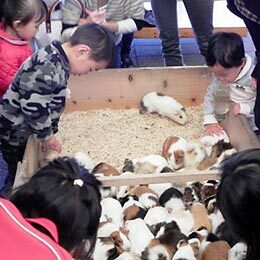 Guinea pigs in the "touch corner"
People can rent on the Inokashira Pond either usual rowing boats or swan-style pedal boats. On this evening nearly all boats were rent out till dusk. The Pond is surrounded by cherry trees and the Park is awfully crowded in the cherry blossom season with viewers. Young dating couples are the majority in this part of the Park. There are also musicians and performers on the open spaces and surrounded by many onlookers and listeners. We can sense here the atmosphere of Kichijoji. Kichijoji is in fact just next door and the alley leading to the Kichijoji station from the Park is filled with shops and restaurants appealing to young people. There is also an area for small children in the Park: a zoo. The Inokashira Park Zoo is divided into two sections and the one on the small "peninsula" of the pond is used for birds and fishes. The main section of the Zoo exists in the western part of the Park. I used to take my small daughter to the Zoo when she was a small girl. She was not much willing to hold guinea pigs in the "touch corner". The same corner still exists and attracts small children. 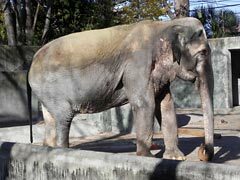 The only large animal in the zoo is the elephant "Hanako". As in other zoos in Japan, large animals were disposed in the Inokashira Zoo during WWII because of the lack of feed. Hanako came to Japan from Thailand in 1947 as an envoy for peace. She was originally called "Onesie", but inherited the name "Hanako" from the elephant that had been disposed during the war. When she came to Japan she was two years old and now she is well over 60 years old, one of the oldest elephants living in Japan. In the east-most corner of the Park there is a museum of Kitamura Seibo (1884-1987). Seibo is a famous and influential sculptor. 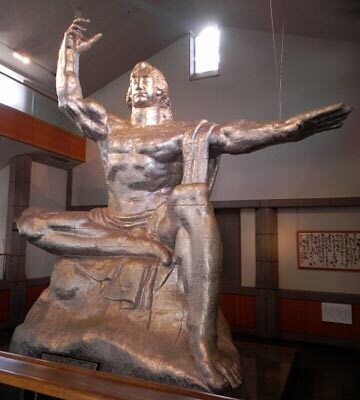 He is famous in Japan for his creation of Peace Statue in Nagasaki. 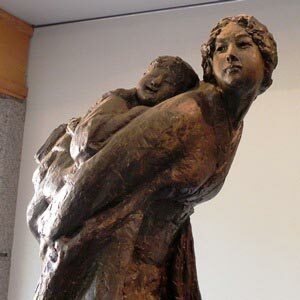 The prototype of the statue was made in his atelier which existed in the Inokashira Park. I wonder why it was possible for an artist to rent a land in a public park for his atelier. Anyhow, he had his atelier in the Inokashira Park since 1953 till the end of his life and developed the idea of the Peace Statue. I was rather enchanted by this "Mother in her young days". Maybe he recalled his own mother keeping him in her back. When he made this statute in 1984 when he was 100 years old.